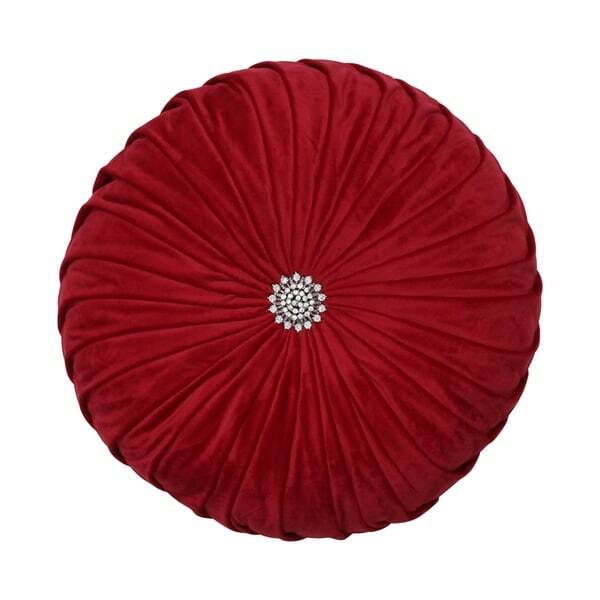 Fun and stylish, this decorative round pillow will refresh your home for the holidays adding visual interest and texture with its velvet pintuck design. Accenting its vintage artistry, the front center has a jeweled button that compliments its ornate charm and festive spirit. When the holidays are over, simply turn the pillow over and the button is a solid red without the holiday "bling" for everyday use. This pillow is filled with recycled polyester fiber-fill. Dimensions 14.0 In. X 14.0 In. X 5.0 In. This pillow is stunning! The red is a very rich color and the centerpiece is visible from across the room. I have a black and white bedroom and this is the centerpiece!! This pillow is beautiful, it makes my living room pop. Looks very expensive but the price is right. I just love it. Thank you Overstock, im not disappointed. This is the cherry to complete my living room. It's gonna make my room POP.